So far the evidence is quite minimal and speculative as to what type of product these containers held...Was it a bitters of some sort? We may never know. Due to the shapes (two variations) these come in, it does not seem to fit in with the typical bitters mold types. I'm most inclined to lean towards a sarsaparilla, cordial, tonic, or some sort of cure/medicine. Nonetheless, these rare bottles do seem to be found throughout the West and no reports thus far from the East-side. Pictured below are the two distinct shapes of the examples that I have been able to find. 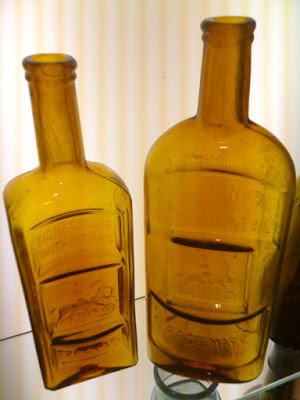 The one on the left is of similar shape to a Hood's Sarsaparilla and is smaller and shorter than it's counterpart on the right. The rounded-shoulder example bears a similar resemblance in shape to a Warner's Safe Cure. J.F. CUTTER EXTRA: 1 Rectangular in Honey-Amber (Mint), 1 Rounded-Shoulder in Honey-Amber (Large Crack on back). Locality: (Los Angeles, Montana Mining Camp). Dr. Barnes: 1 Rectangular in Amber. Locality: (Ebay). RTSIRI: 1 Rectangular in Aqua. 1 Rectangular in Amber. Locality: SAC?? MILLER'S EXTRA: 1 Rectangular in Amber? Locality: OR? R. Littlefield: Had a rectangular amber example up for sale for awhile...Locality: WA or OR?? OLD CUTTERS, You seemed to know the most about the different colors and number of examples from the folks I've spoken with. Do you know of any other Mint examples or specimens out there? Very interesting bottle. I can't recall ever digging even pieces of this bottle. Maybe we can get some input from fellow diggers on this bottle. 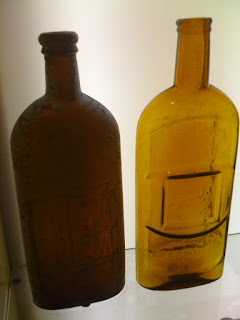 In my experience these bottles come only from late 1880s to early '90s pits. A few have also been found in the S, T and U street dump areas of Sacramento. The majority of that particular dump is late, being "fill" for the low and swampy area prior to homes going up, but many "throwbacks" have also turned up in the mix. To my knowledge, there are only a handful of the amber "Hoods" type and none of the "Warners' lookalike in local collections. As a matter of fact, I have not seen so much as a shard of the second type in this 'hood.